Content writing looks very simple to say but it’s a highly talented skill that helps to keep the reader glued to the content or article written. It is imperative to keep the article attractive and concise depending on the space allotted. Be it a blog, website for marketing products, all require appropriate contents to be displayed on the screen. It’s a profession on its own where the writers produce articles that are engaging on the internet. Besides, they are persons who specializes in providing content that should be relevant by using words that attract and retain frequent users of the website. Content writing does not confine to website but for blog to email marketing, to social media posts, creative content for marketing purposes, and profiles to customer services. 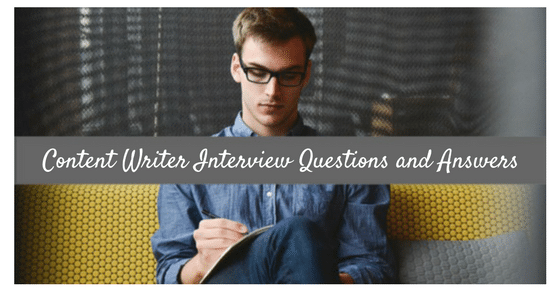 The following mentioned are few content writer interview questions to ask in an interview. By having your own writer, means you are allowing for more empowerment to speak the language of the business by meeting or exchanging views with various categories of people who run the business. Trying to find a content writer for your business or trade, then use the guide below to find the right content writer. It is imperative to know about the basic qualification of the person you intend to hire. If he/she is a graduate in English literature don’t be too happy about it because they might not be able to write creative contents. Read through their resume and find out if they have been involved in writing or editing their work related documents. Sometimes this skill will help to know that they would be accurate in pinpointing grammatical errors. Besides, they would have an eye for reading each sentence word by word. Anyway, it is best if the writer is a graduate and has worked for few years. From this question you would be able to judge the type of articles that they are ‘interested’ to write. Then you would be able to allocate specific contents to such persons depending on their interests. But sometimes, there are writers who do manage to write a variety of topics. This would mean that they have habit of reading and gathering information. Based on the type of contents that you are interested to display, you need to be careful in selecting writers. By reading the articles you would be getting to know on how much depth they are involved in the related subject. Besides, getting writers for writing technical related subjects needs to be based on their technical writing skills and their education qualification. It will help to know what techniques the writer has used and what were the various websites referred. Also it will tell whether the articles were thoroughly read through before writing. Getting to write the appropriate content for the subject requires a step by step process. Some articles are to be written in sequential way and from the writers perspective you would come to know about the way he/she underwent to get the desired content. This will help in making your selection of writers. 4. How do you manage deadlines or priorities? If we are looking to get contents that are really eye catching and attractive then you would need to know the mind-set of the writer. Writers do like to allow their thoughts flow like river. But if there is a boulder on the way the water gets stagnated and moves slowly. So does the creative thoughts. Hence, by getting to know on how much time the writer needs to get contents that are relevant and catchy, you would be able to know whether he/she would be suited to your business. As the type of contents varies so do the type of writers. So you would need to decide on which topic for which type of writer and allocate accordingly. Some writers do need to spend some time while some are able to write depending on their skill. If the writer requires time to write quality contents its best to provide ample time. Writers do indicate their priorities and also how they meet the deadlines. Being a little flexible is best solution to get articles that will be of good quality. 5. What sort of social media tools do you utilize to get help for content writing? Most of the writers do use the common social media tools to get help with writing. Each writer would have specific flair for topics of their interest. Those writers would have books or magazines related to the topic. There could be some who are tech savvy and depending on the type of articles they would know where to get access to reference subjects. This question will allow you to know whether he/she will be referring to the right site or will be able to bring out genuine or relevant contents. You could also make sure of their capability to handle topics assigned. 6. What do you think about key word research? This question is a bit tricky to get to know about the way the writer writes their content. Also you would come to know whether the writer is aware of the importance of using keywords. It would also help to know about the knowledge level of the writer especially the usage of appropriate words that is mostly in use. You would need to get them to speak about their examples and how they utilize their language skills. From such aspects it will help to know whether they are updating themselves. 7. Have you been given feedback on your writing assignment and how have you reciprocated in your work? While making selection for skilled writer, you would be willing to have someone in your team who takes feedback in a positive way. As most of the content work is a collaborative work, making the right changes to the content is based on way the writers incorporate the feedback into the articles. A writer who defends their work or not open to suggestions would be difficult to handle as it would cause lot of headaches. Especially when you are looking for content writers for marketing purpose you would need to be careful in hiring the right candidates. They need to be open to suggestions and positive in their approach, willing to make changes as per needs. 8. Do you prefer to work with your own ideas based on the assignments or couple up with those situations? This will help to know whether the writer is having ideas to incorporate and bring out new thoughts. Based on the skill or talent you would need to know how you hire another writer who would be supportive. Or if the writer is happy to write contents on the subject being given, then you would need to make choice based on the type of work assignments or type of work to be executed example whether marketing or web site contents. Some writers do have lot of ideas and thoughts but they may not know what is the requirement in the market and will be willing to adapt themselves. Such writers are sometimes preferred as they will be willing to change according to the situation and write contents to suit the trend. 9. What are your different writing styles and what tones of writing do you have experience with? This question would help to get in contact with writers who are well versed in writing different styles. When we say style, it means the way the writer writes and the technique the writer uses mainly the word choice, the syntax, the tone. Sometimes, it is also considered as voice that readers listen when they read the content work. Get to know whether the writer uses descriptive style, narrative style, argumentative style or persuasive style. From that you would get to know how they put use of their words, structure their sentence, whether logics are used. Each writer creates their own niche. 10. What type of audiences have you been involved with or associated with? Many writers keep in mind their certain set of target audience to get to write their content. Having being exposed to variety of audiences will help one to know how to manage writing articles. Certain set of audience require little more explanation while certain set of audience who are professional will be conversing in professional level. Some may be targeting younger age groups, while some middle age groups. Some target college graduates, while some working professionals or those seeking career changes. Be it for marketing or for blog, each writers has their own style of writing which is unique to them. Hence, take care to select writers on the type of contents. Writing is something everyone does in their daily chores, but it’s not that everyone can do well. Besides verifying the education background the challenge to get the right content writer will depend on variety of writing job interview questions you ask and extract the information. So happy interviewing!! Previous articleHow to Overcome or Deal with Lack of Focus?